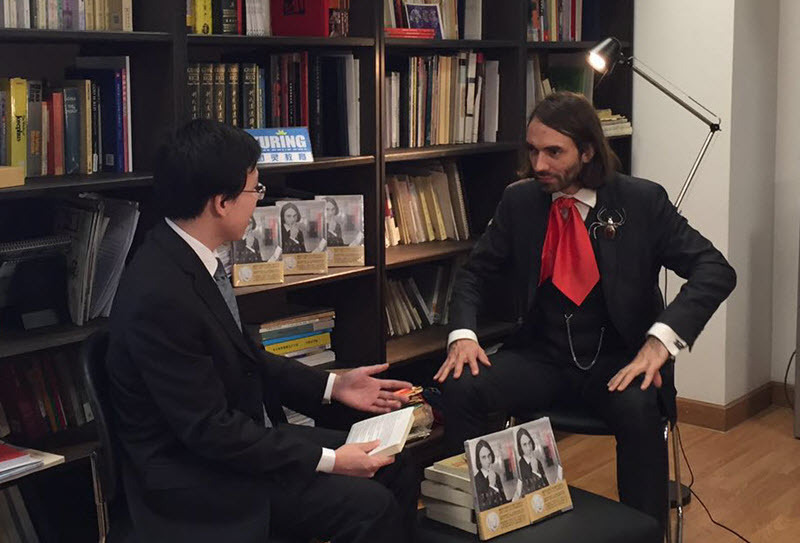 On April 9, during Prof. Villani’s visit to Shanghai, we had an interview with him on behalf on Turing Book. We would like to thank Prof. Villani for having this interview, and Prof. Yaguang Wang of Shanghai Jiao Tong University and Prof. Benoît Vermander of Fudan University for the coordiation. For video, please visit here. For Chinese translation please see here. James: Meet the authors, hear their stories. Welcome to this issue of Turing Interview. This is James Lao. 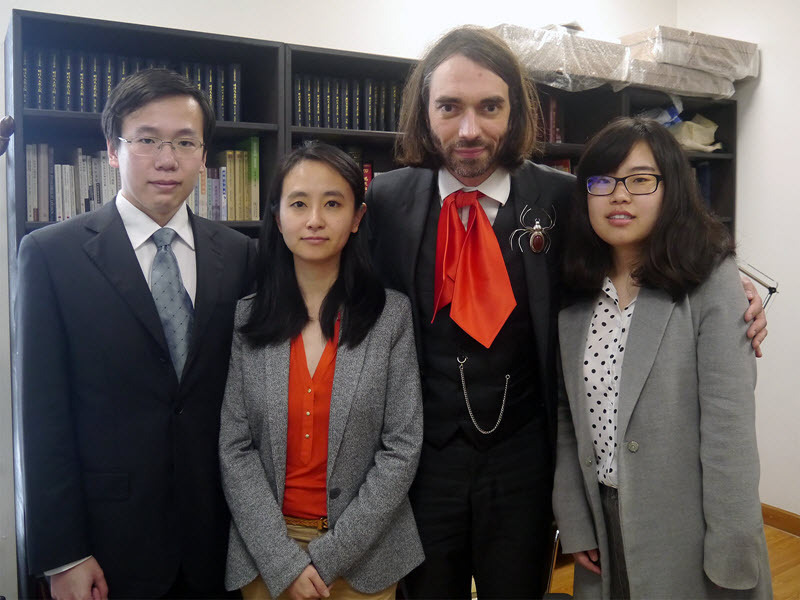 We are much honored to have here today, the author of our new Chinese Edition of “Le Théorème Vivant”, Professor Cédric Villani. Professor Villani is a renowned French mathematician and Fields Medalist of 2010. We all know that the Fields Medal is often regarded as the “Nobel Prize” in mathematics and is only awarded to mathematicians under 40. So today, let’s hear the story of Professor Villani and his book. Welcome Professor Villani. We are so much honored to have you here today. J: We know that you have written this book, “Le Théorème Vivant” to tell us a story about the discovery of a theorem which leads to you winning the Fields Medal. So now this book has been translated into Chinese, and actually have received a very grand applause from all our readers. As the publisher of this Chinese edition, we would love to have our readers or maybe our potential readers or even just math lovers to know you better. So maybe, could you in layman’s term, explain a little bit on what your work is about? V: Um-hmm. As a mathematician, I have been working on various parts of mathematical analysis, which is the art of finely exploring certain structures and certain problems. And my main specialty is in mathematical physics, namely the study of gas and plasma of these crowds of particles which have each their simple properties at individual level, the molecules, for instance then complicated, rich properties coming from the fact that there are many of them in interaction. And over the years I have been involved as a specialist of mathematical entropy, which is a notion of disorder inside crowds of particles, and various ways in which it is connected to problems of probability, gas theory, plasma physics, galactic dynamics, geometry and so on. J: So you have worked in all these many fields? V: Many fields but all connected. And in this particular problem that I am describing in the “Théorème Vivant”, it is about understanding the long-time properties of plasma. Plasma is a simple concept. You take a bunch of electrons, tiny tiny particles with negative charge, and they all interact, repelling each other, you know, and you ask what happens if there is an electric field imposed on the plasma, how it will evolve in time. Now gas theory, classical gas theory tells us, when the particles collide, it leads to some special stability properties, which is very convenient, very common. But now in plasma there are no shocks between the electrons, and in spite of that, it is believed and observed in many situations, that there is some stability. If you try to perturb it with a little bit of electric field, it will spontaneous relax to some equilibrium. Physicists have been working on these phenomena, for now I think, 70 years. But together with my former student Clément Mouhot, we worked on mathematical understanding of this, with a lot of rigor, you know, and understanding what we can deduce, what we can see about the way that gas is governed, plasma is governed by the mathematical equations. J: OK. I think it’s quite unusual for a mathematician to write such a book and tell his own story. What has inspired you to write this book? V: What is unusual is indeed the fact that, it is focused on the story, as you say, not on the result. And in the book, I don’t try to explain what the theorem is about, I don’t try to explain exactly why it is important, but I explain how we proved it, all that is behind the scene, you know, many attempts, the adventure, like a detective story. I like to compare the work of a mathematician to the work of a detective, trying to solve the riddle. When you read a detective story, you are not interested in knowing really who is the guilty man, and why he did this, etc. What is interesting for you is the adventure of finding out, the inquiry, you know, the detective is looking, etc. And, will he find or not? And here is the same principle. Will the mathematician find the theorem or not? So it’s mathematics told as a mystery story. And indeed, it’s quite unusual, I believe it is the only book writing mathematics in this light, you know. And I wrote it because some editor asked me this question, you know, we would like to write a book with you, we would like to be part of the world, but I don’t really care about the math. What I’m interested is what do you do with your days, what is there that you are doing in your mathematician’s work, mathematician’s life. So the book is the answer to the question. So it’s very unusual because it focuses on the life of the mathematicians. Mathematicians talking with other mathematicians, mathematicians fighting with the problem and wrestling with it, mathematicians traveling. So it focuses on the human side, rather on the mathematics itself. J: How long does it actually take you to write this book? V: Writing the book was… it’s hard to say. It’s hard to say because you know when you start, you know when you finish, but in between I have to do many many things apart from writing the book. Absolutely. The book was written partly on my laptop on my knees in the subway, and so on. But anyway, I tell you, it was much faster than proving a theorem. J: So you enjoy writing a literature even better than writing a paper or a thesis? V: It’s a different emotion. It was…Writing for literary is a pleasure, and really, you feel that it’s part of the, you know, the deep human nature of telling stories. So it’s something that goes on like, naturally. It’s not the same kind of suffering that you always have in the scientific research. But both are good. Both are good and pleasant and complementary aspects. J: So we see this book is somehow like a diary. Each chapter is like diary, you have a place, a date and tells a great amount of details. I mean, the amount of details is just amazing, of all these dialogues and all these depictions. So how did you manage to do that? Do you keep a diary, like every day, or you just remember everything? V: You know, we live in a computer era. And to reconstruct the chronology, most of it was based on, you know, my old emails. So I was going through maybe thousands of emails to reconstruct, when I was doing this, how I was doing that, etc. Also, let us say that, I believe, we mathematicians have particularly good memory of conversations. You know, places, not so good. I’m not sure where it was but, conversations, so important in our lives that we remember very well. What we said, at what moment, etc. J: I mean, this book is intended not really for mathematicians, but for the general public to understand your work. V: Let me even say that, it has been proven more difficult to read for the mathematicians than for the general public. J: Because they try to understand. V: Yeah. Because the mathematicians try to understand really the details. Why the details are here? You know, to put the atmosphere, to put it realistic, but not to be understood. So all the details are there to form a kind of impressionist picture, like all the atmosphere. But what if you are a mathematician, oh I need to understand this… It spoils the pleasure of reading. J: OK. So we see that you actually write quite a bit for popular science, and we know, we even noticed that you a new book coming out. Why do you think it is so important to write popular science books, especially when you have so much research work to do? V: That’s not only research that I have to do. I am the director of an institute, president of an association, member of a number of scientific boards, president of some scientific boards, so doing everything. But still, the amount of requests from the society is so enormously large that, I am sure, it is not wasting time to do this. You know, each time I was involved in large scale broad audience projects about mathematics, I found that people were extremely demanding for that, and they ask for more. They want to read about math, they want to understand math, and this is because they are really keen on understanding what is going on and transforming our world nowadays. Not to be left aside. You know, the society is still being transformed at a very fast rate by the rise of technologies. Absolutely mutations in this country, by the way, maybe more than in any other country, given the speed that the economy is changing here. Technology plays such an important role. People want to understand what is the evolution, and mathematics play a more and more important role. So they want to get more familiar with it, not just to understand the math, but to understand who does the math, who are the mathematicians, why they work, where they work, how they work, and so on. J: Maybe we can talk a little bit about yourself. We learned that you come from a family of scholars and artists, like both your parents are teachers in literature. V: Both my parents are literature teachers in high school. J: And you have an uncle that is a professor of mathematics. V: Not only is he a professor of mathematics, but also a great jazz piano player. J: Wow. And you have a brother who is a composer. V: Actually he lives in Los Angeles now, you know, to compose his music for films. J: I mean this is amazing. We are trying to understand what kind of influence does your family have on you, especially when you were still a child? V: It’s hard to say, you know, family influences you, but you never know in which way. My house was full of books, I was reading and reading and reading. There was always this atmosphere, like studying is so important. And apart from that, I could do really what I wanted, but being in this idea that, you know, books and music and so on, is permanent elements of life. It influences you, at subconscious level. J: So, does your family have any specific expectation on you, say they want you to study certain areas or certain subjects? V: Well, I think my family was very keen on me to pursue some higher studies and find my way. They never give me some specific instruction, you have to do this, or that. Probably even though they were in literature, they would rather have me doing science, maybe aware that the world is more and more dominated by science. So maybe you know, to diversify the skills of the family, and they had this idea that you know, Cédric has to look for the best. And it was not clear, should he stay? We were living in the south of France, my father would rather have me stay around. My mother, on the other hand, was very keen on sending me to Paris, the only place where you should develop. Probably both points of view were possible, but it was very important for me to have been in Paris. And there I really found my place. And you know, always this idea that you have to be aware of the tradition, but at the same time see for how things are going on right now, which are the hot topics and whatever. Little by little, of course, I had my own ideas, even though it always was a lot of room for randomness. And I always tell young people in search of advice for the career, they have to find their own way. I always tell them, don’t be a specialist, or rather, when you specialize in something, then after that, go to the next subject, and become specialist also. And always be unsatisfied, and above all, leave some room to the chance. J: So we see that you mentioned a lot about art, music and poetry in your work. Does the family have a lot of influence on that part? V: Maybe. Once my mother told me, after all, you are writer in the family. It was supposed to be, you are the scientist in the family. But yes, of course, at subconscious level, become impregnated by all the atmosphere. And in subtle ways, You feel a heir of tradition. Recently I was in Uruguay, in South America. And from Uruguay there was a tradition of French Uruguayan writers. Two or three of them were really great. For instance, there was Supervielle, there was Lafogue. And my father loves them a lot. I was there, contemplating at the ocean and so on, and I felt OK, it’s like now I somehow I’m on the steps of my father’s interest. The same place where one of his favorite authors was here standing, even though my father almost never traveled. Somehow because of his interest and what specific culture he has in mind and so on, I could feel this link. J: OK. We would love to know, when you first started in math, maybe in college, we know now that you are working most in analysis and in, like mathematical physics, but when you started, did you already have a preference over like algebra or geometry? V: Yes, but quite the opposite preference of now. Actually for long time, analysis was rather at the bottom of my list of interests in mathematics. When I was a teenager, for sure it was geometry. No question about it. And when I was a young adult, algebra was a big thing. I had better grade at algebra and so on. But somehow later I turned out to be an analyst. Choice was made partly by chance, partly by change of interest. Anyhow, now I believe I’m really an analyst at heart, but it took me some time to discover it. J: I actually read your personal website, and on there, there’s a column which mentions some of the heroes of you, so I saw there Ludwig Boltzmann, of course, you’ve studied on him so much; you have Maxwell, you have John Nash, you have Alan Turing. And you mentioned, all of them have been very innovative in applying mathematics to another scientific field in which this had not been done before, and all of them have spent a lot of energy studying some properties of diffusion processes. So could you talk a little bit more about that? V: Hmm. Well, I created my webpages back in 2003, and I tell you it was a big deal in those days. I had to write it in HTML language, and now of course you do it with all the tools which are available to create your own webpages. It’s so easy. But it was a big deal and I had thought a lot about how it should be constructed. And I wanted that there be this gallery of heroes, it was my intention to add a few of them from time to time, but in the end, I stuck to the original set. And I first asked, who are the ones I want to speak about, and only after the selection was made, I realized there were some connections between them. But for sure, one particularly striking thing about them is, with their ability to use the mathematical abstraction to make important, deep discoveries about our world. Even Boltzmann, who is the most physicist of my heroes, used real good mathematical skills to prove his so-called “H theorem”, the law of increase of entropy in the gases. And altogether, they have applied mathematics subjects to fields such as economy, physics, industry, whatever. But there is some unity in the mathematical methods behind. Not just in the point of view, but also in the objects, in the tools. For instance, the notion of entropy was used by several of them with such important outcome. And I think, they are great exemplifications of this fact, this mystery that mathematics is so effective in understanding the reality. J: It seems that you prefer the kind of math that is more applied, or more practical, over those that are, you know, very abstract, maybe, as some people call them, more pure kind of mathematics. Is that really the case? V: Um, I would not put it this way. When I started, I wanted some real, applied things, or applicable. But in the end, like most mathematicians, I am primarily driven the aesthetic, the inner beauty of the field. But I find it even more inspiring when the applications are there, and are important. And I find that it really, when there is this application side, to really fits into the whole of the human society and human life, always between the idea of something beautiful and something useful. The whole of mathematics is in this movement, from beautiful to useful, back and forth. J: This question is actually coming from the (Turing online) community. It’s one of the readers on the community that raised this question. It says that, we know that your work is really on the cutting edge of mathematics, but if we ask you to name just one mathematical concept in your work, which is so important that you think maybe even a layman should know about, what would that concept be? V: Without any doubt – OK, the concept of differential equation is so, so important. It changed our world. Differential equation is a rather old concept, you know, that it’s from the 1600s with Newton and Leibniz, etc. Differential equation actually, you hear about them at the very end of high school. But differential equation changed everything, from the economy, the industry, you use them, live in them and so on. Predictions. So this is something one should really know about. And then, entropy. It’s so central, so important, related to this fundamental fact that our world is made of tiny elements, tiny molecules, and we are macroscopic. So entropy also should be known. And in my lectures, often I talk about differential equations, I talk about entropy, even for layman. J: If you look back all these years that you work on mathematics, what is the most exciting moment that you feel that like the God has shed light on you? What would be that moment? V: There are a few of them. I would not single out one. But in the book, I described a couple of them. Some moments where you have the illumination after a night of torment, or when you realize that you are able to put an end to a project on which you have worked for several years without knowing if it would succeed or not. Really, there are these. Sometimes it’s the, sometimes the reward is the flash, sometimes the reward is the completion, the completion of a big book. When you see the book appeared in print, it’s really an extraordinary moment, but also the moment when you realize that “Ah!” There is something that you will be able to push. And in the book I described the whole process of this mathematical research. At first there is nothing, I mean, you are not even sure what is the question that you would ask. And in the end you have this whole complete set, almost two hundred pages of dense mathematical scribbling that has been put together. It’s a long way. J: Absolutely. So I imagine that when you work, do you do like the traditional way that mathematicians that you know, we have a pen and paper, and you just do all of those formula deductions pages by pages. Do you still do it that way? V: It’s still the best way. But this is, in some sense, to ask the mathematicians, they would say, please have the details. This is not the important thing. The important is the strategy, whether you want to start from what you know and then expand, whether you want to improve a certain method, whether you want to find the new concept, new approach, whatever. It’s the strategy that counts for us, more than the particular way of working. J: You know now there are some computer programs that can do part of these labor work, like doing some of the deductions, or some of the calculations. Do you use any of those in your work? V: I’m rather old-fashioned in this way. I don’t use them. You know, programs are good in certain fields, not yet in others. And for the moment, it has not been a revolution at all in the math. For sure, what has been a revolution is the possibility to compute numerical solutions of differential equations. It has completely changed our relations to the differential equations. But the way we do the proofs, is still rather the old way. Ah, I should be fair, I should add that numerical simulations don’t just provide answers to know, to understand what the solution look like, it also provides intuition. By looking at the numerical solutions, you can change your point of view in the problem, decide something is important or not. But then, in the end, if you want to prove the theorems, you are left basically with yourself. J: So it sounds like mathematics is still part of the field that is not really ready to be taken over by computer. V: You know, when you discuss with specialists of artificial intelligence, when you dig, in the end, that’s always for them the “holy grail”, to do intelligence that will be able to prove theorems. And consider it much more important than program that does chess, or go, or whatever. J: Yeah, I mean, in that topic, you know, nowadays a lot of people are kind of worried, or even some media have this hype, saying, you know, with the rise of computer, and the rise of artificial intelligence, they are taking away jobs, they are conquering the whole world. Do you see that kind of statement actually somehow true, or is it just nonsense? V: It’s intermediate. It’s not completely true, it’s not nonsense either. Fields of artificial intelligence, I mean, are almost as old as computer science. And if you remember “2001 Space Odyssey” by Stanley Kubrick, of course there was this robot gone crazy and so on, it was 50 years ago, almost. And these ideas come from time to time, again and again, depending on whether there is progress or not. We are in the era of progress of artificial intelligence. Still, we are far from intelligence that would take the lead on humans so far. Maybe it will come, maybe we have to worry, but we still have time about that. About the economic issue, there is more worry. I mean many of our jobs may be taken by some machine that are not so intelligent, but OK, and specialized to do something, like in the medical sector, the news sector, in many jobs related to whatever, you know, collecting information, transferring information, etc. And it will be part, however, of larger trend which is the worrying side of the economy, but you know, economy does not wait for robots to be worrying. The state of economy worldwide is in decay and the whole world is in trouble, depending at time it’s more the west, or more the east, or more the other countries which are in trouble, but economy is worrying and behind it, is of course the big issue, which is much larger than technology of how we share. How we share the work, how we share the worth, these are the basic issues. We see that currently there is huge concentration of wealth worldwide, including in this country. There is also concentration of work worldwide. It’s crazy to see that in many places, world in divided between, society is divided between those who are dying from exhaustion of working too much, and those who are dying from not working and crying for work. It is really strange. At the same time, and for long time, the world is separated between those who has too much food and those have not enough. It’s so difficult to redistribute. So the problem is much deeper than technology. J: That’s very true. But I mean, especially in China, I’m not sure about France though, there are many students, maybe some of them are in engineering subjects, they are facing some of the problems like, when they come to the college, they study some fields, some subjects, and later on, maybe 5 years or 10 years later, most likely, some of these knowledge becomes kind of outdated. And they feel like they, you know, they studied something not useful at all, and with all these technological revolutions going on, many of these things used to be calculated or told by humans, now computers have all these thing done. So some of these student may be worrying, what kind of knowledge, what kind of skill should they really acquire in the university? V: First, you know, any Nobel laureate, in biology or chemistry, started his career or her career by learning knowledge which later became outdated. That the way it goes. First learn the knowledge that is outdated and then you continue by learning the new knowledge. You cannot start directly with the new. You have to start and train you brain. And second comment is, the more machines there are, the more there is the need for people to handle the machines. So if you want to be sure to never have your job stolen by a machine, learn how to handle the machine. Know how to program, know the algorithms, and so on. And be prepared. The most important in education is not the knowledge, it’s the training. J: You have worked in France, you have worked in the States, you have come to China for several times, and you have seen all parts of the world. How do you see the difference between the higher education systems in all these countries? And do you see they have different kinds of impact on students? V: The most important difference, and this is the one that most people stress when they have seen these various kinds of cultures, is the nature of the relationship between the master and students. Traditionally in this part of the world, enormous respect, while on the contrary, on the other side, in America, for instance, you will be encouraged to not believe in what the master says and be disrespectful in ways. Each system has advantages and drawbacks. The advantage of the eastern point of view is, it produces a lot of good students and hard-working and ready to take back the legacy, and continue and deepen. The drawback is that it is difficult for these to become revolutionary in their findings. And it is striking to me, for instance, when observing the Chinese mathematicians, how the system has been very successful at producing huge number of excellent quality researchers, but did not manage to produce some super stars, in the past decades either. And by far the most famous young ethnic Chinese mathematician now is Terry Tao, who is really Australian. He studies in Australia and then America. The fact that his is an overseas Chinese maybe is no stranger to the fact that he was so extraordinarily successful. So, you know, one thing that you learn when you travel is that, no system is perfect, and that is always something that one has to understand, to improve. J: For those students to want to be maybe a researcher later in mathematics, what do you see as the very key kind of traits, or features they need to have to become successful? V: In mathematics. You have to really love the subject first. Sincerely. You have to be very tenacious, you know, never give up before you understand, and you have to be very curious, open-minded, look for imagination and so on. J: Okay, I think that all the questions that I have. But I mean, just out of curiosity, I know you must have answered that question for thousands of times, why have you put that spider on you there? V: I knew you would ask. That is my personal story. Let me mention that I have a number of spiders from various parts of the world. Now people offer to me. Some of them I bought, some of them were made for me. This one, for instance, comes from Niger in Africa, the stone is carnelian, and was made by a Tuareg artist, you know these big guys from the desert, all dressed in blue, who has become a friend. So each of my spiders has some story. And the reason, is my story. J: All right. Thank you very much Professor Villani. Thank you very much for coming to this interview.